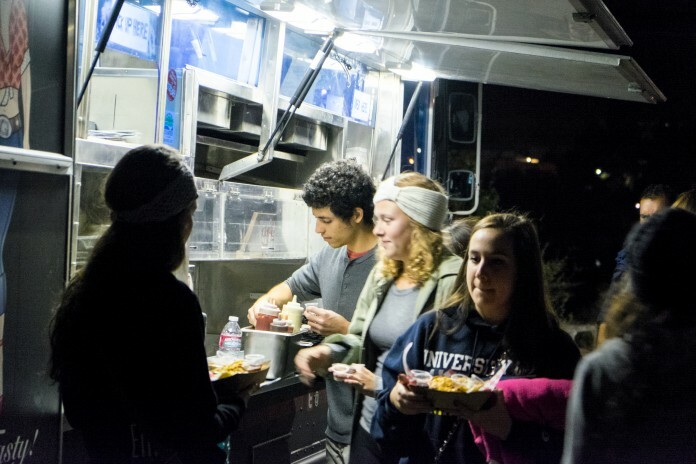 In celebration of “Food Truck Cinema: Gauchos Give Back,” hosted by UCSB First, Gauchos at University of California, Santa Barbara gathered on the cold Wednesday evening of Nov. 19 at the UCen Lawn to give back to their community, enjoy some entertainment, eat delicious food, and the watch the film Anchorman near the sparkling lagoon. As an entrance fee, attendees were simply asked to bring a can of nonperishable food that would be given back to the university community as a donation to the Associated Student’s Food Bank. “I thought it was a really good idea to require a donation,” said fourth-year English and psychology major Emily Ogle. UCSB First is an organization, sponsored by UCSB alumni, that is based on emphasizing and promoting student philanthropies. UCSB First supports other philanthropic organizations, hosting the following groups at the event: Dance Marathon at UCSB, Active Minds at UCSB, Education Abroad Program, UCSB DJ Club, UCSB MultiCultural Center, and of course, the AS Food Bank. Co-chair Jessica Fenton, a fourth-year political science and communication major, said that this organization hosts numerous events, such as the philanthropy awards dinner, Storke Tower tours, Senior Breakfast, Let it Snow, and the Senior Class Gift Campaign. The spirit of giving continued as seniors received free class T-shirts with their graduating year. There was even more giving when UCSB First Co-Chair Anne Hamner announced the senior class gift that would be left behind: a donation to the Student Safety Enhancement Fund. This fund was created in light of the Isla Vista shooting that occurred last spring, and with the donation, UCSB and its partners will work to improve the community’s communication systems, infrastructure, and emergency preparedness. There was also food provided by Georgia’s Smokehouse, who served up a variety of barbecue dishes and Southern comfort food. Cesar Viveros, one of the truck employees says, “This event is really good for local businesses such as ours, especially because sales were pretty steady for a couple of hours. We had a pretty good turn out.” In addition to BBQ, Georgia’s Smokehouse conveniently sold coffee, hot chocolate, and popcorn for students to keep warm and enjoy the film. There was also a special appearance by the one and only Olé. Students lined up to take photos with the mascot and a frame that read “#stayclassyUCSB,” a reference to the featured film. Later in the evening, everyone gathered on the center of the UCen lawn to watch Anchorman, which was projected onto a big blue inflatable screen tied to weighted trash cans. Friends, couples, and students relaxed on the grass as they watched the comedy against the backdrop of the lagoon, and the buzz of the food trucks’ engines hummed in the background while the aroma of hamburgers and pork sliders lingered in the air. Fenton said that UCSB First received 157 attendance cards (people who did not RSVP on Facebook) and received a total of 670 RSVP’s. The event also filled up around three bins with canned goods, donating a total of 252 items to the AS Food Bank in time for Thanksgiving.